Easter is on its way — are you ready for an influx of children? Share the joy and hope of Easter by providing kids with unique ways to worship the Lord. Prepare ahead of time and make Easter worship an event kids will remember all year long. These Easter worship ideas for kids’ church are good for both junior and senior kids’ ministries. You may need to train a few volunteers to help you with these worship ideas. Come out of the tomb: A few weeks before Easter, decorate a group of cardboard boxes to look like a tomb opening. Lightly paint the boxes with grey spray paint or cover them with brown paper and draw the stone outline with a black marker. Arrange the boxes as two pillars and put a large, refrigerator box on top. Play Easter songs and lead kids through the tomb opening. Explain to kids that like Jesus, we will be resurrected. Parade around the room and pass through the “tomb” opening while singing the song. Ribbons of joy: You could use small ribbon wreaths but I prefer large six-foot ribbons or swathes of fabric. Have kids pair off, one taking one end and one child taking another. As the music plays, kids can shake the ribbon to make it move. If you’re like me, and have some particularly exuberant kids, you may have to walk among the worshippers to keep order. Another good tip is to pair off an excited child with a volunteer. Carry it to the cross: We have a giant cross in our kids church that we bring out every Easter. Even if you can’t build a cross, you can tack up four posterboards on a wall and draw the outline of a cross. Before kids arrive, wad up dozens of paper balls and put them in a box. Quietly explain that the paper balls represent our sin. 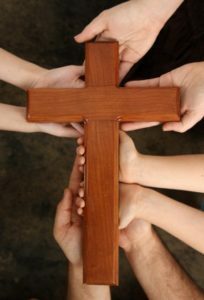 Demonstrate to kids that they can take their sins to the cross and leave them there. Play a worship song about the cross and you go first with your paper ball. Encourage kids to be respectful during the song. When the last paper ball is left at the cross, lift your hands and eyes to heaven and lead the kids in praise to God for the cross. Read more from Mimi by visiting her website, Encouragement for Christians.